Beavers are truly the engineers of the wild. The type of lodge or den they'll build is dependent on the surrounding environment and materials available. And, in order to house their families, they may have several dens in different locations. Beavers are the largest North American rodents. They're semi-aquatic and tend to build their dens near any available water sources that also have a good food supply. It's a common misconception that they prefer fish, but they are, in fact, strict vegetarians gnawing on bark, shrubs, trees -- anything that will keep their teeth growth under control. Their eating habits lend to their den-building habits, as they use their sharpened teeth to fell trees and engineer their mansions. Beaver dens are useful for protection from predators and must be sturdy enough to withstand the elements. Whether built on a riverbank, in the water or on the shore, these dens generally possess the same key internal features. The outside is composed of branches and logs, held together with mud. Being semi-aquatic creatures enables them to build underwater entrances, and a single family may have more than one den. Dens built into riverbanks may simply begin with several holes one to four feet below the waterline and lead into a singular chamber. A mud and stick lodge is one built in the water whereby a stump, log or island is used as the base with several underwater entrances to it. Regardless of a den's location, its internal structure remains relatively uniform. Upon entering a den, one would find it lined with soft bark, grass and wood chips. Measuring 8 feet wide and 3 feet high, the single "room" provides an adequate environment for nesting, birthing, raising young and protection. Over years, the den will be improved upon and rebuilt. Beavers breed in December and give birth in March so, despite potentially having several dens, will stick to a single one over the winter months. Dens provide fantastic homes and protection not only for beavers but also for other animals that will nest on top of lodges. In addition, larger mammals will feed on materials from downed trees and shrubs, while woodpeckers will call these materials home. 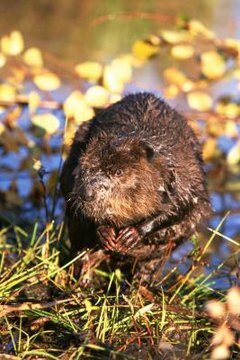 Beaver dams can even create new environments for aquatic species. Unfortunately, this beaver behavior works against the economic interests of humans, with damage to the timber industry and agriculture crops as fallen trees can cause significant flooding. Do River Otters Build Dams? How Does a Porcupine Take Care of Its Young?